Whomp whomp. There're no Kenny McCormicks for sale. Oh my God, they killed Kenny!! 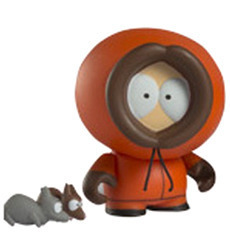 Well, there is one figure already made of him in his dead-form, so there's gotta be an alive Kenny too for when he comes back out of his mother!!! This figure doesn't have the MOST detail out of all the other ones, but the fact that the hoodie strings are ACTUAL strings is a nice touch.